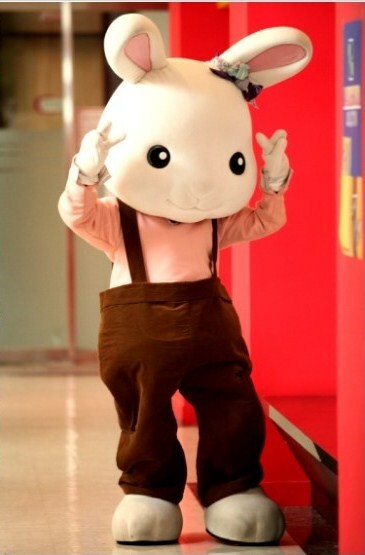 In episode 12 of Glory Jane (pka Man of Honor) broadcast of November 17th, Park Min Young was dressing up a gigantic rabbit doll costume and transforming into a cute rabbit, unfolding an ultra-positive charm of the character, Yoon Jae In again. The scenes were shot at the Fashion Centre of Sindang-dong, Seoul. Park Min Young was appearing at the filming set wearing a rabbit doll costume, which made her even hard to walk. In addition, she had to hold the head of the rabbit doll costume which is over three times bigger than the size of her head. The cute “rabbit doll costume” shows the unique thick flavor of Park Min Young, so the production film crews also lamented that “rabbit fairy was born!” Causing the atmosphere on the scene to heat up. During the gap between filming, Park Min Young was posing various lovely expression that looks like a fairy, drew lots of attention. Because of having to wear the rabbit costume on the day of shooting, so Park Min Young binded up her hair demurely, and her face barely applied any make-up. The nature dressng of Park Min young was similar to the doll, highlighting her fresh and natural beauty. As the rabbit doll costume was very huge, causing Park Min Young to tumble while walking when wearing the costume, but she still wore the costume to shoot for five hours, showing the fighting spirit of professional actors. Even the physically-able male actors will be tired after such filming, but Park Min Young did not reveal any weariness, and kept displaying her distinctive sunny smile. As such the production crews was praising her. the 11th episode, Chun Jung Myung, who has to hide his special feelings for Park Min Young, goes through a hard time. People are paying lots of attention to the drama on whether Chun Jung Myung and Park Min Young can overcome their misunderstanding that they're siblings to develop a love line.